Yet another wives tale that plagued many a mother and child is that surrounding the fear of not getting a tetanus vaccine would lead inevitably to a child getting tetanus from stepping on a rusty nail. Setting aside for a moment the likelihood of stepping on a rusty nail to begin with is there any validation to this claim, or is it truly just an old wives tale? The basic idea here is that stepping on a rusty nail—or rather, the wound resulting from stepping on a rusty nail—will result in tetanus, what is sometimes referred to as “lockjaw.” Tetanus is a nasty disease that causes the stiffening if muscles and does affect the face; the jaws can’t be opened, hence the nickname. The source of this wives tale comes from World War II, where many soldiers were infected with and died from tetanus, mostly infected via deep puncture wounds. Hence this wives tale is more of a half- truth; the wounds from stepping on a nail can cause tetanus, but the rust has nothing whatsoever to do with it. Tetanus comes from infection breeding where there is little to no oxygen, so a deep puncture would certainly qualifies as a potential danger. It is the dirt that may have been on the puncturing instrument that can lead to infection, so a nail needs no rust to lead to tetanus, just dirt. In the trenches of WWII there were plenty of sharp, dirty objects that would qualify, and after the tetanus vaccine was created and introduced, the suffering and deaths dropped sharply. Here was a case where the tetanus vaccine made a lot of sense, as the soldiers were in a very hazardous environment with a high chance of contracting the disease. Do today’s children have the same odds? Ultimately the decision a parent makes about whether or not to vaccinate their child should be made after proper research with qualified sources. Certainly there are less chances of sustaining deep, dirty puncture wounds in every day life than a soldier in the trenches of The Big One, but the possibility exists. So, too, do proper antibiotic treatments for treating deep puncture wounds—thus if you opted out of a tetanus shot when you were young there are still treatment options if a wayward rusty nail finds your foot. Why the Link between Rust and Tetanus? How did “rusty nail” get linked up with infecting lockjaw in the first place? Likely it came about as stories of soldiers suffering and dying from tetanus were released, and as is common with many fallacies and wives tales, correlation implied causation. A good filter of logic to apply to this—and many—situation is “correlation does not imply causation”. This simply means that just because two events occurred at roughly the same time, there does not mean a cause and effect relationship exists. In this case a person steps on a rusty nail and develops tetanus; it is easy to say the rusty nail caused the tetanus, but in reality the dirty wound not properly treated caused the lockjaw, not the rust on the nail. My boyfriend stood on a nail outside ,could have been rusty I dont know ,but he wont go hospital and ive heard he can get lock jaw ,septaseemia (sos for spelling) blood poision and even he could die is this true? Only in extreme cases. However, a rusty nail can be dangerous, as it is a perfect environment for the Clostridium tetani—a bacterium causing tetanus—spores to grow. Please see link here which will advise further on what to do. Today actually,I went to the park and stepped on a rusted nail.It went right through my shoe!I,personally,have not gotten a tentitus shot.It's only bruised and it bled only a little after it was injured.I just disinfected it and squeezed out and liquid. so, if a rusty nail makes only a superficial injury,does it have to give the patient antibiotic ? another thing,after cleaning the wounddo we cover it or no? Why a rusty nail? 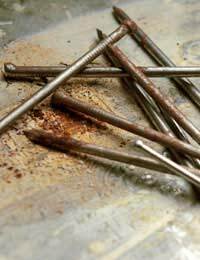 There is a good reason why rusty nails, as opposed to new ones, can cause tetanus. Tetanus is an anaerobic spore, meaning that it dies when exposed to oxygen (just like botulism). Tetanus spores are found in the intestines of animals and sometimes humans, and are released in their feces, which once deposited in the soil can live for years. Enter a rusty nail. Tetanus can not live on a nail that's clean. But, if there is a tetanus spore on a nail in the soil, and then the nail develops rust, the tetanus will live even after being pulled out of the ground. The tetanus lives underneath the rust because the rust is keeping it from getting oxygen. If a dirty nail is pulled from the ground, once exposed to oxygen, the tetanus will likely die. The tetanus from WWII was most likely due not to the bullets--but to the soldiers crawling on the ground, having been in farm fields with animal feces, and having bullets pierce the dirt on the uniforms. Also, your article states that a 'dirty wound not treated properly' caused the tetanus. But if the tetanus has entered the bloodstream, then no amount of cleaning will get the tetanus spores out of the system. In this case the best treatment would be to make the wound bleed as much as possible, and hopefully get the tetanus spores out of the bloodstream before they lodge and get carried through the body.